Built in the 1930s, the SeaCrest Oceanfront Hotel has been welcoming families to Pismo Beach, California for generations. 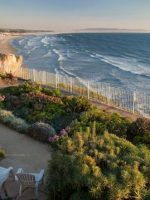 Originally a small, two-story motel overlooking the Pacific Ocean in a destination made popular for being central between Los Angeles and San Francisco, the property grew in size and recently underwent a $10-million renovation to fully update and modernize the property. 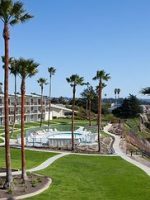 Featuring a beach-y theme, the horseshoe-shaped hotel features rooms with balconies and patios with partial or full views of the ocean, as well as direct access the wide stretch of white sand that is Pismo Beach. 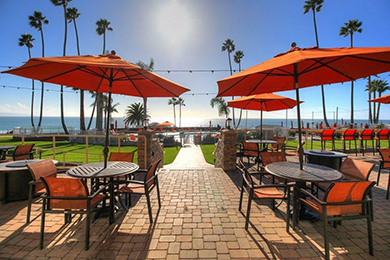 The hotel provides free parking, breakfast and Wi-Fi, and with its pool and beach within minutes from Pismo Beach Pier and the area’s shopping and dining, SeaCrest makes for a comfortable and cozy place for families to enjoy a weekend or week on the beach. The hotel's 158 rooms are spread across three buildings, the original two-story main building, built in the 1930s, and two flanking towers with four stories that were added in the 1950s. All rooms received a full renovation in 2009 and feature balconies or walk-out patios, larger mini-fridges, microwaves, Keurig coffeemakers, iPod docking stations, flat-screen TVs, and free Wi-Fi. Most rooms offer two queen beds with a bathroom with tub and shower, with king bed rooms also available. No connecting rooms are offered so the queen bedrooms disappear the fastest during the summer months. There are five Family Suites, which feature a king bed and a sitting area with a small, closed-off bedroom featuring two twin beds for children. Some rooms have pullout sleeper chairs, but they are so few and far between that they are not guaranteed to families looking for extra space. Cots are also not allowed, although the hotel offers Pack 'n Plays for infants and toddlers. My wife and I stayed here with our 2yr old daughter and Colton at the front desk was more than happy to accommodate our needs and did so with such grace. This was our first time here and the customer service we received was enough for us to return. We absolutely love coming here. We feel welcomed every time, it is our home away from home. The new rom renovations are great, very contemporary and modern. Customer service is top notch any time of the day. SeaCrest's pool is small, but big enough for kids to splash and enjoy, along with three hot tubs. A windbreak wall keeps the ocean breezes off the pool, as they can get chilly, even in the the summer. Beside the pool is a patio with ample seating, grills and fire pits for families to enjoy. Pismo Beach's stretch of sand extends beneath the SeaCrest Hotel, with direct access via 78 stairs taking families to the Pacific Ocean. Families with little kids or wheelchairs will need to drive to other Pismo Beach access points, if stairs are an issue. As of August 2016, the only dining available at the SeaCrest is its complimentary breakfast buffet, which is made up of pastries, cereals, fresh fruits and other continental items to enjoy while sitting outside on the expansive patio overlooking the ocean. The hotel has lined up a partnership with a local market to open and operate a dining facility across the hotel parking lot, with foods that will be available to purchase to stock in the room as well as dining, including sandwiches, brick-over pizzas and a full bar. 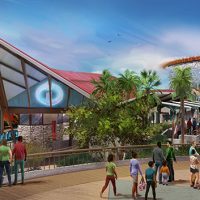 It is slated to open by summer 2017. Meanwhile, the hotel offers "Thirstade," which delivers beer and wine directly to a guest's room - a nice perk for parents! Parking is free at the SeaCrest, which features direct beach access. Beach towels are available for use at no charge for the pool or beach. The hotel is pet friendly and offers ground-floor rooms in one of its towers specifically to guests with pets. Rooms have patio access to grass and a walking area for dogs, up to 50 pounds, and the hotel provides cleanup bags. Bicycle rentals are available at the front lobby for a minimal fee. Summer months are peak season for the SeaCrest, as families are looking for a California beach getaway on the shores of the Pacific. In the winter and spring months, the hotel is less crowded, as the ocean and weather make it a bit too cold for taking in the sea. Located between San Francisco and Los Angeles, Pismo Beach is about three hours by car from either of the main city destinations. The nearest local airport is San Luis Obispo County Regional Airport, and Amtrak trains pass through the area. You will need a car to get to Pismo Beach and its attractions, as the hotels stretch along the shore for miles away the center of Pismo Beach. Nearby hiking, wineries and other fun are also best reached by car. Parking is free at area hotels, and plentiful in town. On Wednesday nights, 5 to 7 p.m., the hotel features a winery event on its rooftop, with views of the ocean. Local wineries come in to provide free samples of area wines.